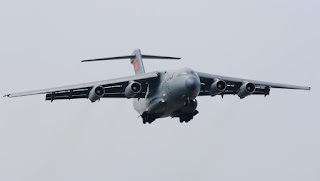 BEIJING, --China is ready to test its Y-20 military transport aircraft over the Yunnan-Guizhou Plateau, according to photos uploaded to a Chinese military website, the Sina Military Network based in Beijing reported on June 23. The internet photos showed a Y-20 with serial number 783 at Lijiang airport. This is the first time Xian Aircraft Industrial Corporation will have tested the Y-20 in a high-altitude region. With the atmospheric pressure lower than at sea level, the aircraft needs more speed to take off and the atmosphere and high local temperature also affects the thrust the aircraft's engine can generate. As Lijiang airport is only 2,200 meters above sea level, the Sina Military Network said this is unlikely to be the final altitude test for the Y-20. Photos uploaded to the internet earlier this year revealed the Y-20 undergoing testing in low temperature conditions at an unknown airbase in northern China. Tang Changhong, the chief designer of the Y-20, said the aircraft will complete all tests in different conditions by the end of the year. A Y-20 military transport aircraft of the Aviation Industry Corporation of China (AVIC) at last year's Zhuhai Airshow, Nov. 11, 2014.